Bruford Levin Upper Extremities does a fine job of combining the progressive rock leanings of modern King Crimson with fine jazz stylings in the mode of Miles Davis and others, while moving into previously unexplored directions. If one really had to pick a label for this album, jazz would probably be the one that comes to mind, but, honestly, pigeonholing this as jazz would be a disservice to the album, because it is so much more. This is truly quite a fine album, and I seem to like it more with each listening. 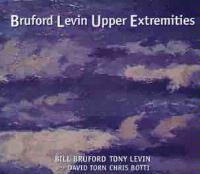 Bruford Levin Upper Extremities will be available April 14th, 1998 at fine music stores everywhere. According to Papa Bear Records website, single copies are available for purchase directly from them now, although the official release date is not until the 14th. The price is $15.00 and $2.50 for shipping and handling. 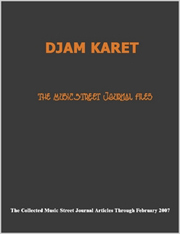 To order from Papa Bear Records, write to Papa Bear Records, P.O. Box 498, Woodstock, NY, 12498. Be sure to visit their web page at http://www.papabear.com , to get a copy of the online order form or call 1-800-688-2227 to order by phone. A very surreal intro gives way to a rather dark track featuring some excellent non-lyrical vocal overtones. This track takes a very static song structure and uses it to create a piece which obtains it`s movement by alternating the various sonic overlays. Cerulean sea is a number which contains a good amount of tension, and some rather spooky passages. This one features some very innovative drum work. This is the first of three extremely short pieces, the longest weighing in at 27 seconds, which seem to serve as connecting pieces. The liner notes describe these pieces as "Bruford playing with sticks and mallets on derelict piano in Levin`s garage." A nice funk groove with some almost Miles Davisish trumpet work starts this track off. The funk feel continues throughout the song, giving a nice jazz-oriented mood, while Torn plays some fairly Frippish guitar lines. This is a very pleasant funk/jazz sort of piece. Beginning and ending with recordings from a band dinner, this track is certainly in a Discipline sort of mode, and features some pleasant guitar/trumpet interplay. The opening tones to this almost bring to mind the theme song to a sci-fi film of some sort. Then, gradually, Bruford comes in with some interesting electronic drum work. Soon, some very lonely, melancholy trumpet strains join the song. This one builds very gradually, seeming to gain a feeling of triumph from out of the sadness in which it began, before breaking into the ending sequence, Bruford on electronic drums that sound vaguely like an extremely resonant xylophone. This track is more Bruford, mallets, sticks and that derelict piano, this time for a mere 19 seconds. Beginning much in a modern Crimson sort of mode, the trumpet to this song seems to do a nice job of complementing the eclectic guitar work, which is at times similar to both Robert Fripp and Adrian Belew. This track, a very nicely quirky arrangement, focuses on some rather unique timing changes. Eventually, it breaks for a few moments into a very pleasing trumpet and stick dominated instrumental break, which has some guitar work drawing on Red era Crimson. The song eventually comes back to the opening riff, before moving on into a very nice rhythmically dominated groove. Fin de Siecle contains several false endings, before finally finishing. DrumBass takes it`s title from the unusual instrument on which it is played, which is described as a "Taos drum, with Ned Steinberger-designed upright neck attached, strings running over the drum." Bruford and Levin both play this instrument simultaneously to create this unique and quite brief piece. Starting and finishing with Levin on a bowed upright bass, this track includes a riff which is quite reminiscent of Led Zeppelin`s Kashmir, and some very Red era Crimson styled guitar work. Bruford describes this song as "what I would want Cream to play were they still in existence." This number is the same song as Drumbass with the addition of Torn`s guitar work, which adds a rather bluesy texture to the piece. Featuring percussion sounds that had so much bottom that the band felt no need for bass, Thick with Thin Air begins with some vocal strains in the vein of Gregorian chant. This is a very nicely atmospheric number, and another which calls to mind a film soundtrack. Once the acoustic guitar comes in, this track takes on an almost Zeppelinish flavor. This is a very nice composition. The bass half of the stick work on this is certainly my favorite bass work of any song that I have ever heard. This piece caught my attention the first time I heard it and has continued to grow on me. The bass line seems to flow very smoothly, while conveying some quite interesting rhythmic and melodic movement. This song is certainly bass driven, but contains some nice work by Torn and Bruford as well. At the end of this piece, it just seems to dissolve into chaos. As Bruford says "Sometimes there`s nowhere for things to go except to pieces." This is my favorite work on the album. This is the final track of Bruford, his percussion tools, and the piano. Deeper Blue begins with some very nice slow bass work, and eventually some very likable, leisurely trumpet strains join in to impart a very pleasing jazz feel to the piece. Bruford makes fine use of brushes on his drums here. This is another strong track on an exceptionally strong album. Another nice groove composition, this one features some rather interesting, and, at times, somewhat dissonant trumpet work. Everyone seems to really outdo themselves on this track, which Levin describes as "the kitchen sink". This song could easily pass as an old Crimson tune, but with more modern textures.